November marked 18 months of existence for Geeks to Go. We continue to experience steady, and phenomenal growth! Unique visits are expanding by about 50% per month. Google seems to like us. 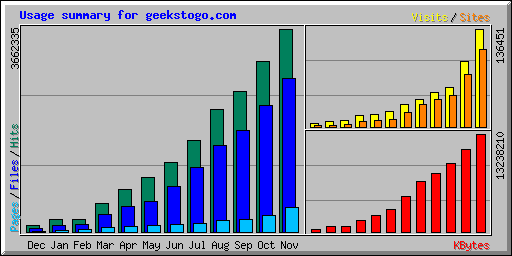 Their Googlebot visited this site over 62,000 times, and consumed 535 MB of bandwidth. We're very fortunate to have a terrific volunteer staff, and many more that are currently learning. I'm confident we'll continue to grow, and be able to service that growth with the timely, friendly help our members have come to know.